I think it was lucky for me that I read a review about this book before I started it. I somehow skimmed over the part in the summary where it mentions that it's really dark. Really, REALLY dark. And that's something that's good to know going in, because I'd expected something different altogether otherwise. I liked Luce, though I did think her extreme loyalty to Catarina right from the start was odd. I mean, I can understand loyalty after you've been friends for a while, but right from the moment you meet? That was a bit unbelievable for me. I liked that Luce still had a conscience, something most of the other girls seemed to have lost at the same time they traded their legs for fins. I get that awful, unspeakable things have happened to these girls, but that doesn't make it less wrong to sink ships and kill people. Just for the fun of it. It was a bit off-putting. I had a hard time connecting to other characters because they delighted so much in killing people. Innocent people who just happened to sail their boats at the wrong place and time. Catarina annoyed me a bit, she and Luce were supposedly really close, but she doesn't want to tell Luce about her past and then turns around and discusses it with a newcomer. I thought she was two-faced and just not the kind of person I'd put my trust in. I had expected a bit more from the underwater-world, but it seemed a bit bland and grey. 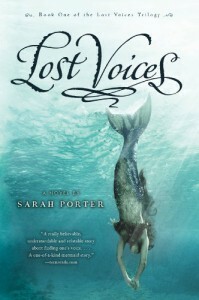 I did however like the whole idea of girls becoming mermaids for the reasons in this book and the mermaid-lore described in the book, including the singing and especially all their songs being different. I'm curious to see what will happen in the next book and if a certain boy will make another appearance, cause that could really add some extra intrigue! I enjoyed the book, but going in you need to know that it's really dark. The ending left me feeling a bit confused, it somehow didn't feel like the end of a book. But I did like Luce and I'm looking forward to finding out what happens next!